Rolf is not your ordinary wolf; he is a good little wolf. 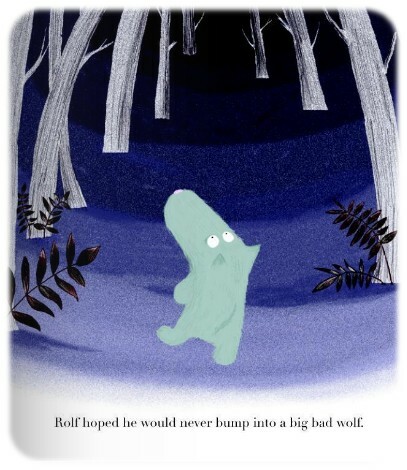 He likes baking cakes and eating vegetables, and he is kind to his friends.His friend Mrs Boggins warns him however that most wolves are not like him, and Rolf soon discovers that for himself when he meets a Big Bad Wolf in the forest. Big Bad Wolf is keen to show Rolf their true nature. Can Rolf truly be good or is there something darker lurking deep inside that cute exterior? When Rolf finally finds his inner Big Bad Wolf, he manages to use it to a good end. But will Rolf be proved right in the end? 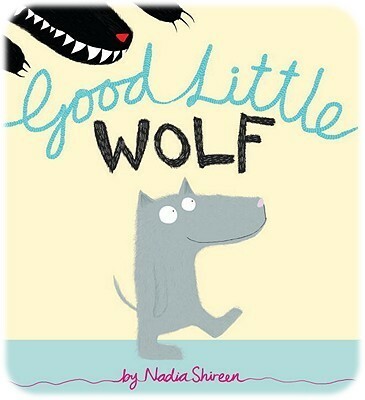 This original and refreshing take on traditional tales is a great debut from author/illustrator Nadia Shireen. 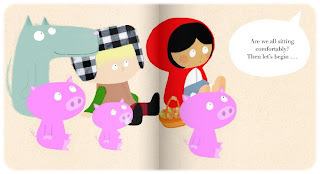 The three little pigs, Little Red Riding Hood and her grandma, and of course the Big Bad Wolf all make an appearance in the story and elements of both fairy-tales are evoked in Good Little Wolf. But although it takes inspitation from traditional stories, its ingenuity shines through straight away. The twist at the very end had my children totally taken aback during storytime. I really don’t think they were expecting that, and neither did I when I first read it! But it unequivocally adds to the originality of Good Little Wolf. Rolf is such a smashing character, so endearing and kind, and yet not weak. He tries really hard to defy wolfy stereotypes and although not completely successful, he still manages to prove that he can still be good. It is an interesting theme to explore in a children’s book: even the kindest of characters can have a dark side, and there is nothing wrong with that, as long as it is not used malevolently. A second theme, of not wanting to conform, is also interesting: Rolf does not want to be Big Bad Wolf, even though this is what is expected of him. This could initiate interesting conversations with slightly older audiences, who I think will also particularly love Big Bad Wolf, particularly because he is showing no redeeming features: his cunning, conniving nature certainly shows. Nadia Shireen’s quirky illustrations fits the tone of the story perfectly; Rolf is cute and endearing, Mrs Boggins and the pigs are satisfyingly round, and Big Bad Wolf is scary and funny, without looking too menacing for younger audiences. There is a clever use of colour to mirror the more ominous moments. Both comedy and drama are portrayed with equal success. I love Nadia’s style; it is stylish and fresh, quirky but not overly so. I particularly love the way she draws the human characters in this book; there is a real sense of innocence in the way they are drawn, and overall her artwork has great child appeal. I really loved Good Little Wolf and I urge you to go and find out for yourselves just how fun and clever it is! Warmly recommended. Come back tomorrow to find out Nadia’s Fabulous Five selection – with a very unusual theme!!! I advertised it on Twitter too!